When it comes to preparing meals in the kitchen, a decent chopping board is just as, if not more important than a good quality knife. It’s an essential piece of kit for any kitchen and helps keep food prep clean and tidy. You may not have considered the different types of chopping board available, as they all do the same thing, surely? However, there are a few factors to consider before you just buy one willy-nilly that will ensure you purchase a kitchen staple rather than a throw-away item. If you’re someone who hates washing up, then a plastic chopping board will be able to go in the dishwasher. Plastic chopping boards tend to come in a range of funky colours and shapes these days, but if you’re shopping for aesthetics, then wooden chopping boards look good on any kitchen worktop. Wooden chopping boards also give a more ‘professional’ feel to a kitchen and are seen as more of a feature rather than being shoved away in a cupboard. Don’t forget to think about how big your kitchen is and what sort of food you will be preparing. 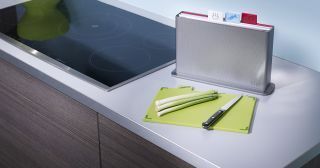 If you have limited worktop space then compact chopping boards that are either small in size or come with a rack/tidy are a great way to stop your kitchen from looking cluttered. You may want to invest in a set of boards for preparing meat, fish and veg separately, and opt for bigger boards for occasions such as Sunday lunch with the family. We’ve rounded up the best chopping boards 2017 has to offer, catering to those budding chefs, interior design lovers and those who simply need to chop stuff up- and speaking of chopping stuff up, here's a list of the best kitchen knives so you can put your new chopping board to good use! If you’re serious about cooking and style, then this chopping board set will complete your kitchen perfectly. The set includes four different boards all indexed with a food type and stored neatly in a file for ease of use. These boards will ensure you keep raw meat, veg, fish and cooked food separate for the most hygienic and organised food preparation. The Joseph Joseph brand features twice on our list for the best chopping boards but this Index set rises above the rest based on its multi-use capabilities and organised storage. For anyone trying to replace the unsightly pile of mismatched chopping boards that appear in most of our kitchens at some point, throw them all out and replace them with these. This beautiful Glebe Cutting Board is the perfect centrepiece for carving meats at Sunday lunch or on the side in a country kitchen. It is a large board that has a cute heart cut-out in the corner, and each board is hand-made making each one unique in some way. This chunky, rustic chopping board would make an ideal gift for those who love to host dinner parties or for treating yourself to a new statement kitchen piece. Every household needs a good quality wooden carving board. If you often find cooking for one leaves you with loads of leftovers, or you like to follow recipes to a tee, then the Obsessive Chef Chopping Board will ensure there is no wastage by using exactly the right amount of ingredients. At a glance, this extremely detailed chopping board might seem a little OTT, but the markings are surprisingly helpful, enabling you to chop precise measurements of any ingredients. This is particularly useful for cake decorating or any baking scenario where identical designs are a must. We love the bamboo effect and this would look good as a feature on any kitchen worktop. One thing many of us can’t stand is when you slice up a nice piece of tiger bread or French stick and crumbs go everywhere. The Zeller Bamboo Bread Chopping board is here to introduce you to a world without crumbs. This specially created bread board has been designed with a crumb tray that can easily be removed and emptied into the bin whenever necessary. It also includes a bread knife that is neatly and safely stored on the side of the board which is handy for anyone that doesn't have or need a knife block in their kitchen. If you simply want a surface to chop your veggies on then this Colourworks Reversible Cutting Board is a great value option for any kitchen. It is reversible so can be used on both sides for different ingredients and comes in a range of colours to suit your tastes. There’s no fuss with this board as it fits easily in the dishwasher and is thin for easy storage in a cupboard or drawer. This is a great student gift that can be added to as the culinary skills build up as the Colourworks range boasts a variety of colour choices and additional boards. Have you ever found yourself chopping something only for it to go flying halfway across the room? You’re not alone. With the OXO Good Grips Cutting Board you can now prepare food with ease. This is a large board with non-slip edges to keep it from slipping on your worktop and it is double sided to avoid cross-contamination. It also has a handy border which is designed to catch any escaping liquids on the board. A pretty handy all rounder for anyone who likes the look of the Joseph Joseph Index Advance Chopping Board Set but thinks it might be over the top. One of the worst things when carving a turkey or any other joint of meat is that all the juices escape and make a terrible mess. However, with the Joseph & Joseph Cut & Carve board, you don’t have to worry about mess again. This board looks almost like a tray, which on one side will catch any crumbs or liquid so that it is easy to dispose of, and on the other has little spikes for hassle-free meat carving. It’s also dishwasher safe making clean-up after meal time a whole lot easier. One downside; if you hand wash this board with a regular washing sponge, the sponge fibers often get trapped within the spikes on the carving side of the board. If you’re looking for a decent chopping board that will look good on display then Big Box Art Chopping Boards have some great design choices. Whether you want a beautiful landscape picture, a quirky pattern or a wildlife scene, Big Box Art has them all. We particularly like the New York City Skyline Chopping Board which would look fantastic in a modern town house or apartment kitchen. Yes, they are more 'fashion over function' but if you are going to keep your chopping board out on the kitchen worktop, it needs to look good, right? Ok, so this is not strictly a chopping board but it deserves a place on our list for its style and adaptability. If you like to host dinner parties then an after dinner cheese board will almost certainly make an appearance. We love this slate cheese board from The Just Slate Company for slicing cheddar and scoring camembert. It not only makes serving cheese easier, it's great for carving loaves and looks slick. You can also purchase slate boards in different shapes such as hearts which make the perfect gift for any cheese lover. It comes with chalk so that you can write little notes to your guests or label each cheese.